One of the most unique thing that can be discovered in this village is the salt making, salts from Kusamba Village is produced traditionally by the local people using traditional tools. The sands that has been saturated by the sea water is taken to the salt making hut, then more sea water is strained to it to wash out the salt. The salt water is then poured into a shallow trough made out of palm trees. After that, the trough is lined up along the sea shores during the salt making season. As the sun evaporates the water, the dried salt is taken and put into the a basket to be packed and sold. 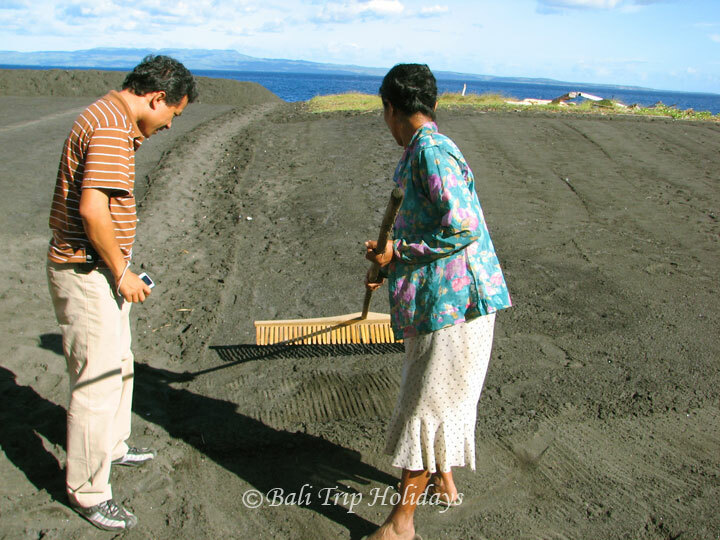 The salts that are produced here has a very good quality which contains high iodine that are good for health.There are about 30 groups of people who are still producing salts with this traditional way, but it these people may be the last generation of the salt farmers in Bali because now days, less people would like to this job. Salt farmers in this village are very friendly, they would kindly invite visitors to see the process of the salt making. 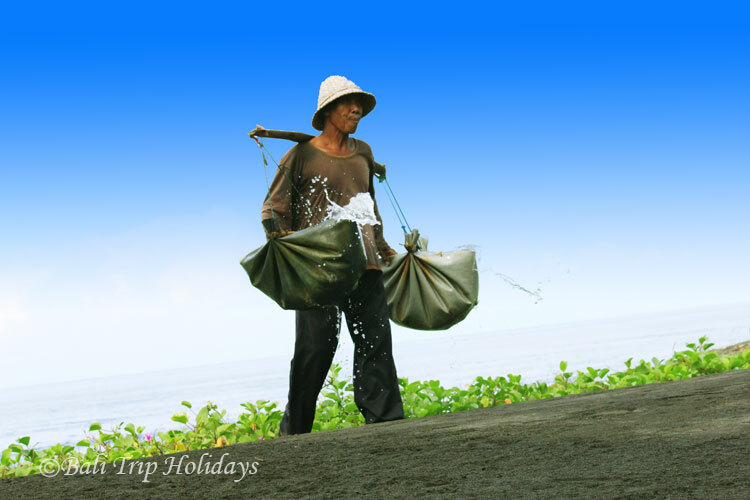 It would be an unforgettable experience for all visitors to see and get involved during the natural sea salt production process. The Kusamba Natural Sea Salt is sold in souvenir shops all around Bali, it costs Rp 26.500 per jar (300gr). Many tourists are interested in this natural salt, it would be a good souvenir to bring back for friends and families. This entry was posted in Bali, News, Places and tagged bali, klungkung, kusamba, places, salt, salt makers, salt making, traditional, village. Bookmark the permalink.